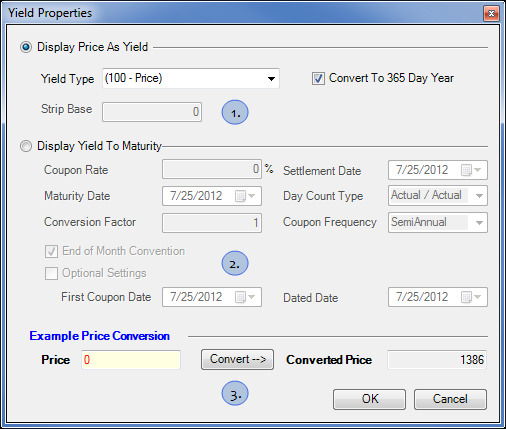 You can choose to display your Price Axis in yield using the Price Axis context menu. This functionality is very similar to what can be done in MD Trader, offering both Price as Yield and Yield to Maturity options. Displays price as a percentage representing annual rate of return. No Conv: The instrument price is in yield. Conversion not necessary. (100-Price): The yield is calculated by subtracting the instrument price from 100. Calculation for the Euribor. ((10000-Price)/100): The yield is calculated by subtracting the instrument price from 10000 and dividing the result by 100. Calculation for the Eurodollar. (((10000-(Price+Strip Base))/100): Eurodollar Strip type yield, a base (settlement) is added to the instrument price before the Eurodollar conversion. Calculation for the exchange traded Strip, Pack or Bundle. Convert to 365 Day Year: Converts 360 days to 365 days. Strip Base: Average settlement price of the contracts in an exchange traded Strip, Pack or Bundle. The Strip Base is added to the instrument price before the conversion. Displays price based on the rate of return if held until the maturity date. An algorithm calculates the price accurate to six decimal places. All other fields are required unless otherwise noted. Coupon Rate: Annual interest rate (as a decimal). Must be greater than 0.1 and less than 100.00 and accurate to 4 digits precision. Settlement Date: The date that the trade settles. Must be less than the maturity date and greater than today. Maturity Date: The redemption date of the bond. Must be greater than the settlement date and greater than today. Day Count Type: The convention used for counting the days between two dates. Actual: The real number of days between two dates. Leap year counts for 366 days. 360: The year has 360 days ahead. 365: The year has 365 days. 30: If the second date falls on the 31st of the month it is changed to the 30th only if the first date falls on the 30th or 31st. 30E: If the second date falls on the 31st of the month it is always changed to the 30th. Conversion Factor (Not Required): The factor by which the futures price will be multiplied if the specified bond is delivered against it. Must be greater than 0.1 and less than 5.0 and accurate to 4 digits precision. End of Month Convention: Determines whether coupon payments always occur on the last day of the month if the settlement date falls on the last day of the month. First Coupon Date: The first real coupon date. Must be less than the maturity date and be a valid coupon date. Dated Date: The date upon which interest accrual begins. Must be less than the first coupon date. Example Price Conversion Lets you view the converted price based on the parameters you select.